Earn recurring cash through our affiliate program, or by subcontracting us for custom design or development on your clients' Shopify stores. A few simple ways you can make more and do less. 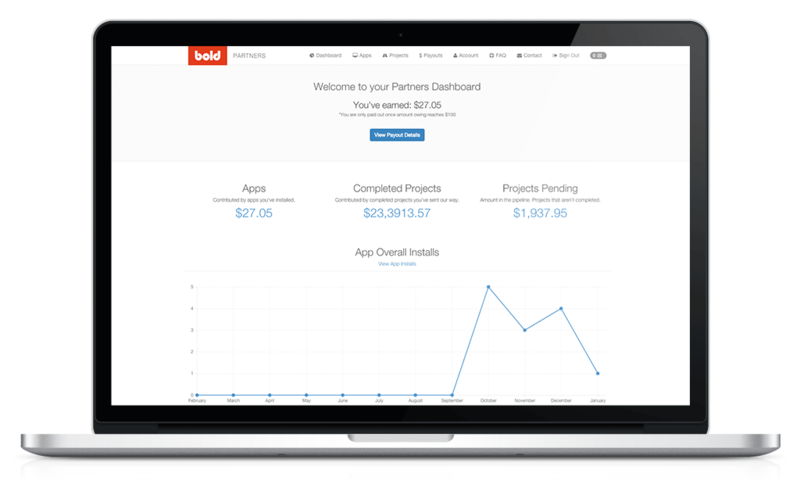 Your dashboard shows you detailed breakdowns of how much you’re making from each app, which apps are your best performers, how much you've earned, how much your payouts are going to be, and more. 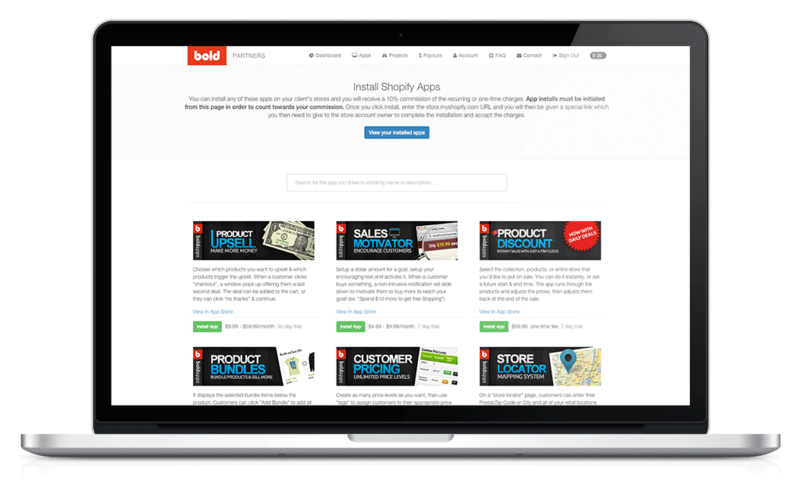 Bold apps are proven to help Shopify stores make more sales. Your customers will thank your for suggesting them, and you’ll get a new revenue stream as our way of saying thanks for helping us out. 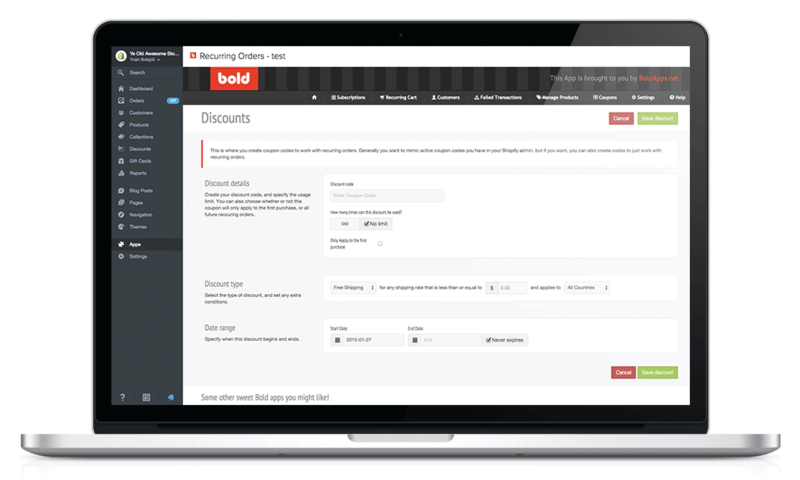 Instead of turning work away, send them over to a trusted Shopify Partner. You can stay keep up the relationship with your client while we do the heavy lifting...and we’ll give you a cut of the project. Designers and Developers who use Shopify. Too Many Projects On The Go? With the massive popularity of Shopify, there is more and more design and development work out there for web shops of all sizes. If you find that you are unable to take on the amount of work coming your way, we’d like to help you out and give you a kickback for your referral. Now instead of turning away great clients, you can say yes to the project, point them our way, and get a cut. We’re happy, you’re happy, and most importantly the customer is happy. Everyone wins! Are you a designer getting requests for dev jobs that you can’t take on? Send them our way and get some cash for your confidence in us. If it’s a preferred client of yours, you can be part of the project all the way through, including scoping and consulting...in fact, the bigger role you play, the bigger commission you get. Hear what people have to say about us. "The Bold Commerce Team rules! We honestly can’t live without their apps. They’re willing to help whenever needed and are among the most responsive and competent developers. I highly recommend their apps to any store that wants to see their sales grow and never worry about the app developer leaving you hanging when you need them." "It is extremely refreshing to have finally found a company that is actually able to deliver technical specs requested on time. We have worked with several other companies in the past and had come to determine, after several frustrating experiences, that developers just weren't capable of performing to this kind of standard, but it seems it just took us a few tries to find the right team. If I could give more than 5 stars, I would!" "We don't usually write reviews, but this Product Options app is essential to our store, and the updates to the app keep getting better and better! We're very impressed and grateful for this app, as we couldn't run our store without it! Thank you, Bold Apps, for creating such practical, intuitive, creative, and easy-to-use apps!" "The "Customer Pricing" app is an invaluable tool! Our store would not function as needed without it. After searching the Shopify App Store for similar apps, none come close to the functionality that this app has to offer."